There are several benefits of nutrient timing. These involve maximizing your body’s response to exercise and use of nutrients. Although the specifics for each sport and athlete may differ, all athletes will benefit from keeping these three strategies in mind when creating their own plan. Having adequate body fat is also essential for health and performance. Nutrient Timing for Peak Performance is your key to consuming the right nutrients at the right time for maximum training results and an edge on your competition. 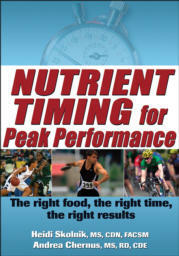 Applicable to every athlete at any performance level, this comprehensive resource by leading sport nutritionists offers easy-to-use principles of nutrient timing for better performance. Gain the ultimate advantage! Nutrient Timing for Peak Performance is your guide to consuming the right foods at the right time for optimal results in training or competition. Renowned sport nutritionists Heidi Skolnik and Andrea Chernus have worked alongside today’s top athletes, including professional football players and elite marathoners. In Nutrient Timing for Peak Performance, they’ve combined the latest dietetic research with practical advice you can use to create a personalized action plan based on the needs of your body, your sport, and your goals. With guidelines specific to training and competition, as well as sample meal and snack plans, you’ll see how certain nutrients in precise amounts at specific times can improve consistency of energy, speed recovery, increase the building effects of strength training, diminish muscle breakdown, improve immune function, and minimize your risk of injury. Whether you are a dedicated triathlete, high school pitcher, college swimmer, competitive powerlifter, or professional soccer player, Nutrient Timing for Peak Performance is your guide to peak athletic training and performance. Heidi Skolnik, MS, CDN, FACSM, is the president of Nutrition Conditioning, Inc., a nutrition consulting practice. She has master’s degrees in exercise science and human nutrition. She is also a New York State certified nutritionist, a fellow with the American College of Sports Medicine (ACSM), and a certified ACSM health fitness instructor. Skolnik is the sports nutrition consultant to the New York Giants, the Juilliard School, and the School of American Ballet. She is a senior nutritionist at the Women’s Sports Medicine Center at Hospital for Special Surgery and part of the New York Road Runners sports nutrition team. Previously, Skolnik spent 15 years working with the New York Mets. She has also worked with professional athletes in football, baseball, basketball, cycling, and soccer; Olympic-level athletes; marathoners; and collegiate wrestlers. As an expert resource for national media, Skolnik has been referenced in newspapers and national magazines such as Men’s Health, Stack, Self, Glamour, GQ, andReal Simple. She appears frequently on TV and has been seen on CNN American Morning and Headline News, theToday Show, Good Morning America, theEarly Show, Primetime, 20/20, Extra, andtheFood Network. Andrea Chernus, MS, RD, CDE, is a registered dietitian and New York State certified dietitian and nutritionist. She holds a master’s degree in nutrition and exercise physiology from Columbia University inNew York. She maintains a full-time private practice on the upper west side in New York City, where she sees many athletes and performers. Chernus consults with runners in the New York Road Runners Club and the New York City Marathon and is part of the New York Road Runners sports nutrition team. As part of Nutrition Conditioning, Inc., she also consults to the Juilliard School. Previously, she was the clinical nutritionist for Columbia University Health and Related Services. Chernus’ articles have been published in Training & Conditioning, Stack, Dance Spirit, Bottom Line, and Pointe.She has been quoted in Outdoors, Shape, Self, YM, Women’s Day, andBicycling. She has also appeared on local and national TV. "Nutrient Timing for Peak Performance offers the latest research on nutrient timing and explains how to create a personal nutrition plan for success. It is a valuable source of information for serious athletes." "As an athlete, you always want an edge over the competition. Nutrient Timing for Peak Performance explains how to gain that advantage by consuming the right foods, at the right time, for maximum performance."